I joked to a friend that I might as well live in Pasadena since I spent half my time there and then thought maybe I’d test that conjecture. I did an experiment for a week where I charted all the time I spent in different cities and made two pie charts, including and not including sleep time. I cut out transit times and cities passed in transit for ease. I posted this on Facebook a month ago, but then thought it would be beneficial to continue also posting these here on my blog. Here are my results. This experiment probably deserves a redo, seeing the short amount of time I did it. San Marino, a city I visit from time to time was surprisingly cut out. El Monte is rarely visited. The rate of Altadena was skewed higher due to a man I was seeing at the time (but no longer.) 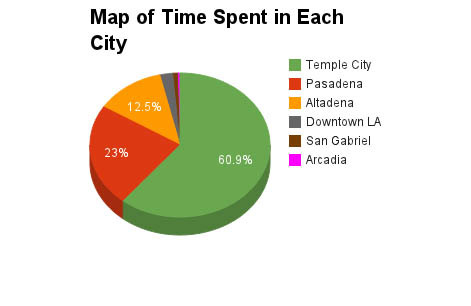 Were I to redo it for a month, there would probably be higher rates in Arcadia and San Gabriel, along with a larger diversity of cities. I’ll see if I find the time.